The Students’ Representative Council (SRC) is a body that represents USyd undergraduates. It first opened in 1929 to “defend and advance” the interests of students. It splits its role with the University of Sydney Union (USU). Both the SRC and the USU are student-led organisations, and both receive money from the Students Services and Amenities Fee (SSAF) you pay each semester to cover “non-academic services” and university “support programs”. However, the most basic distinction between the two consists in the role they serve: the USU funds more corporate-seeming amenities like food outlets and clubs/societies, while the SRC is known for its long history of activism. This dual union model is unique, as most other universities in the country merge both the USU and SRC’s functions. Aside from the permanent, non-student staff who work at the SRC (think: legal advisors, admin, and caseworkers), everyone else in the building rotates annually. Each year, an election* is held in semester two to find the next president, Honi editorial team, and 33 council positions. Voting is open for all undergraduate students who bring their student ID at the polling booth. Check out next week’s election edition of Honi to see a full list of 2019 contenders. The elections are the stomping ground of USyd’s political factions—groups of students, often aligned with mainstream parties, who pool resources to win votes. Behind the scenes, key factional organisers have already spent months rallying together every person they know in order to form a squad of campaigners. You’ll then see a whole lot of Facebook DP changes on Wednesday, 5 September, when online campaigning starts. Notifications will invite you to ‘like’ Facebook pages at 12:01am on the dot. That one person you met in a first year tute and literally haven’t spoken to since will shoot you a message, either asking you to campaign, change your own profile pic to support their candidate’s cause, or as the voting days loom near, you’ll be asked to vote for a certain person or ticket. The following Monday, on the 10th, physical campaigning starts. A-Frame stands will line Eastern Avenue, large slogans will be chalked on the pavement and clusters of people wearing the same colour will gather around campaign tables. 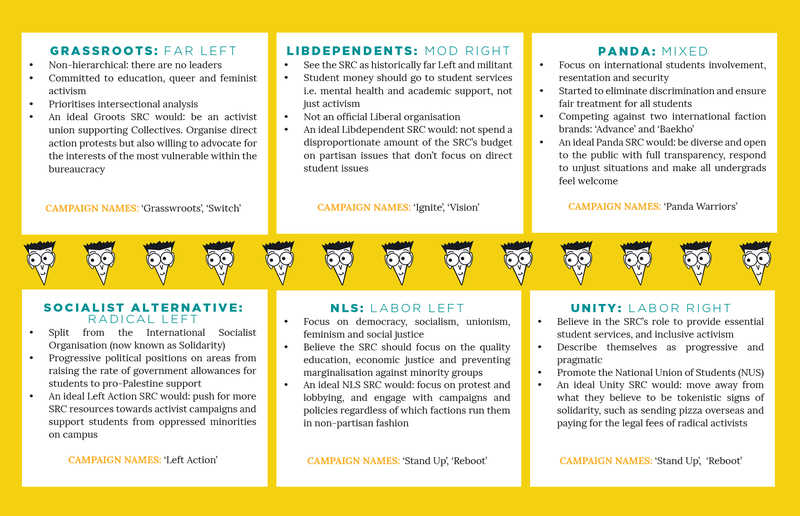 Every piece of promotional or campaigning material, be it shirts or online policies, must have the name and student ID of an individual who is responsible for each candidate or ticket. This is to ensure there is a degree of liability, so anything that goes wrong can be pinned on the single authoriser. It also verifies the candidate as legitimate and gives a port-of-call for contact. Why are groups so petty about trivial things? It all comes down to branding, especially colours. They normally align with precedent or national standards. For example, Liberals often go with blue (however, moderate Libs lean towards white), while Labor groups opt for red. There’s been a shakeup this year though—at the time of publication, the Socialist Alternative (usually purple) and conservative ‘Liberal’ tickets are fighting over the colour red. They’ll have to negotiate with one another to have distinct enough designs. You bet. Each candidate and ticket, unless independent, are connected to the big dogs of young political parties, factions, and alliances. The scramble to get votes traditionally leads to verbal, online, and sometimes physical tiffs. Why? Because like all elections, the more votes you get determines how much power, influence and say you have over the SRC: whether that’s in council, the president’s office or even Honi. And of course, getting any leadership role in the SRC is a big deal for student politicians looking to pad out their CVs, build their profile for next year’s election, or make a difference. Why are tickets called weird, unclear things? So you’ve got clear political factions in the ticket names like ‘Grassroots for…’ or ‘Liberals for…’ Then there are random names like ‘Reboot for…’, ‘Switch for…’ or ‘Shake Up for…’ Here, it’s important to distinguish between factions and campaign brands, which are the names formally on the ballot. There’s a few reasons for why a faction might choose a different brand name. In the SRC regulations, one brand can only have a maximum of 17 tickets. To get around this, factions resort to running on two or more different names, that are still aligned to the original brand. That’s why Grassroots runs some tickets under a ‘Grassroots’ brand and some under ‘Switch’. But sometimes it’s strategic. More conservative factions often want to avoid association with the political alignment implied by their name. By distancing themselves, voters are forced to consider their policies, not the stereotypical assumptions about their party. Which is why the Modlibs rarely run as ‘Liberals’. Why will I be handed weird pieces of paper? It all comes down to preference deals, which can make or break an election. Factions sit down with one another and make alliances. ‘Walk and talk’ campaigners then hand you a ‘how to vote’ card with three boxes in order: they’ll recommend you vote #1 for their candidate, and then #2 and #3 for their allies. But that’s where the line is drawn with that arrangement. Let’s say I take a ‘how to vote’ sheet from ‘Party Rockers’. The sheet of paper asks me to ‘VOTE  Party Poopers’ and VOTE  Party Rockers’. I go rogue and Vote  ‘Party Pies’ because I actually like their policies more than the ‘Party Rockers’. Then, come the final count of votes, ‘Party Poopers’ is wiped out the competition first because they’ve got the least numbers. The SRC doesn’t care that ‘Party Poopers’ wanted their votes to fall into the hands of ‘Party Rockers’. My single vote trickles onto the count of ‘Party Pies’ instead. Yet pre-polling data has shown students tend not to deviate from a how to vote card’s suggested order: Most people, it would be seem, just want to get rid of the badgering campaigners, take the sheet to end the conversation, and follow it exactly. Beyond a swarm of strangers chasing you down Cadigal Green or following you into class to lecture bash, participation by casting your vote is vital. While the election period can seem overwhelming, taking the time to weigh up the different campaigns can ensure the administration of the SRC aligns with your beliefs and passions. If you’re like me, disillusioned and easily annoyed, it’s hard to step back and see that the strangers approaching you are only doing so because they care deeply about the candidate, their policies and by extension, their political beliefs. Or they’re just campaigning for their friend. You’re not going to agree with every candidate’s beliefs, but you will be affected by the choices of next year’s president or council. Student politics is a lot like the wider, national Australian politics, and having a firm grasp of what happens on campus helps make sense of situations like last week’s Liberal leadership spill down in Canberra. And, at best, a lot of people involved in stupol are there for long run; they’re the politicians of the future and more likely than not, the names you’ll hear running the country in the decades to come. The Sequel: WTF is repselect? If you make it to the end of election season and stupol has still got your interest, you’ll start hearing about something called repselect. Day to day, the SRC is run by elected office bearers and executive members, who are responsible for managing campaigns, collectives and even the SRC’s permanent staff. Repselect is where these OBs and exec members are elected. There’s the paid executive roles (general secretary), unpaid executive roles (vice president), paid office bearer positions (wom*n’s oficers), and unpaid office bearer positions (ACAR officers). Some of these can only be given to elected councillors (general executive member), but for others, anyone in the student body can nominate. That said, only the 33 councillors—that’s the people you elect—can vote in repselect. Before the actual vote, factions will align, deals will be done, and the roles of the SRC will be stitched up. * The elections also secure the next SRC representative group in the National Union of Students (NUS), however for coherence, we have chosen to focus on USyd-exclusive positions.